Kober! Arghans! Sten! Sten! Sten! Yn pub karrek? Yn pub men! An gwella sten? Yn Kernow! I posted recently about the rousing progress through the county of Cornwall of the Man Engine, Britain’s biggest ever mechanical puppet. It was more than just a nostalgic entertainment: it was a poignant and salutary reminder of the difficult, dangerous, often fatal work undertaken by the Cornish miners, and of our mining heritage here in the county in the far SW of England. 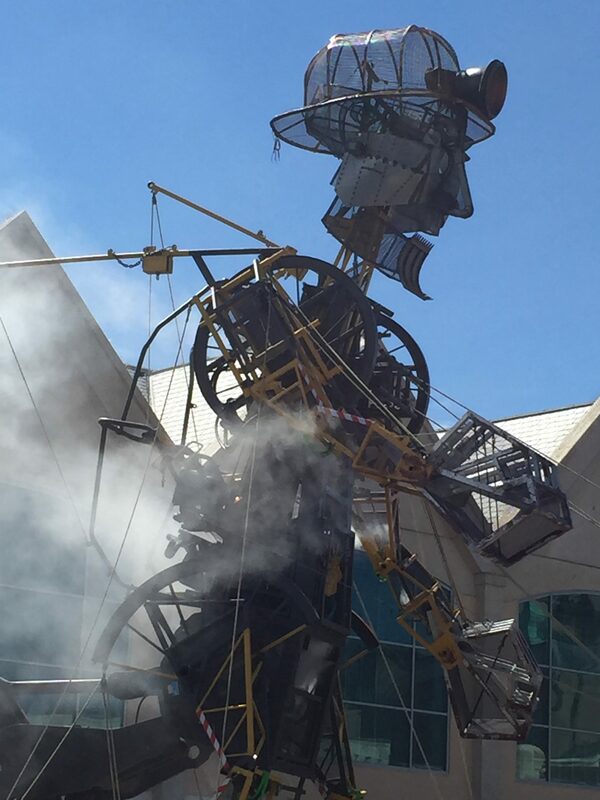 This is the stirring anthem sung by the choirs and crowds as the Man Engine ‘transformed’ from his prone position to his imposing full height of over ten metres. Can’t you feel em ‘neath yer skin? Hard rock mining involves the excavation of metal mineral ores such as tin, copper and gold, unlike soft rock mining, such as for coal. Cousin Jacks was the nickname for émigré Cornish miners from the USA to Australia, once the great diaspora began in the mid-19C, when the copper began to be mined out and the market for other minerals became too volatile for it to continue to be economically viable in many Cornish mines. More info at this BBC site (archived), and HERE. Cornish pasties, the pastry-cased pies crimped down one side to hold it together, were the miners’ traditional lunch or ‘croust’. Beef and potato were the staple filling, often mixed with onion and swede, although many other ingredients have been controversially substituted. 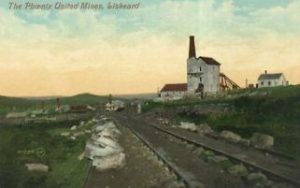 Some mines had a hot oven up top in which the pasties could be kept warm until lunchtime. The owner’s name would often be inscribed in the pastry to facilitate identification. Some miners would reserve a small corner to leave for the ‘knockers’ – the mischievous ‘little people’ of the mines, believed to cause all kinds of mayhem and bad luck if not placated by these human intruders into their subterranean habitat. I believe the ‘empanadas’ of Argentina, Chile, etc., are S. American pasties based on the recipes the emigrant Cornish miners imported there when they took to working in the mines there after the diaspora. Jane Harvey was the daughter of John Harvey from Hayle, in west Cornwall. In 1779 he established a foundry and engineering works there. He worked there with Richard Trevithick (1771-1833, born to a mine captain and miner’s daughter in a village near Camborne, inventor of many high-pressure steam-powered devices and locomotives, including improved versions of Newcomen and Watt’s earlier mine pumping engines) and other leading engineers. In 1797 Jane married Trevithick. Harvey’s became the main mining engine foundry in the world, with an international market served through their own port at Foundry Town, Hayle. The White Hart building, established in Foundry Square, Hayle in 1838, was built for Jane and Trevithick by her brother, who succeeded his father (died 1802) as the foundry’s owner. It still stands, an imposing sight, and functions as a hotel. This entry was posted in Cornwall and tagged Caradon Mining District, Haka Balweyth, Hard rock Cornish miners, Jane Harvey, Richard Trevithick, The Man Engine by Simon Lavery. Bookmark the permalink. This is very close to my heart – as well as growing up on Bodmin Moor, surrounded by ruined engine-houses and with family who worked at South Crofty, my new book series is set in a fictitious mining community at the beginning of the last century. I’ve done so much research for it, and to see the resurgence of interest is wonderful – amazing to see so much of it being brought (back) to life. Thank you so much for this post, I will return to it over and over, I’m sure! Glad you liked it Terri. Why not post links here to the book series? I’m sure others would find it of interest to see them. Yes, the mining heritage here in Cornwall is a powerful force, and it’s always moving to see the ruins and relics of that past world – in this rugged, beautiful landscape. My pleasure. Same to you! Another very thought provoking post Simon and thanks for giving us the background to the song. Fascinating post. When I was in Cornwall 20 years or so ago, a local took my friend and I to a pub that he said was the one D. H. Lawrence frequented. The barman said because I was half Scottish, I qualified as a ‘Cousin Jack’ — though none of that side of my family were miners to my knowledge (my Hungarian grandfather on my mother’s side mined coal in SW Ohio; he and his fellows inspired folklore in Hungary about the “magic rock” in America). That was the first time I’d heard the term. A friend was married to a woman from Butte, Montana (called Personville/Poisonville by Dashiell Hammett in “Red Harvest”) which is riddled with mines worked by Cornish emigres. He said she said that pasties were a common lunch mean there. Fascinating, Paula. How wonderful to hear such tales via a blog. Presumably the pub was The Tinner’s Arms at Zennor – I just posted about DHL in Cornwall. Might interest you. Thanks for the comment. Thanks for another great post – the Cornish mining heritage is so important, & it’s good to read the real stories behind the ‘Man Engine’. And also to read & have a better understanding of those wonderful Cornish folk songs.